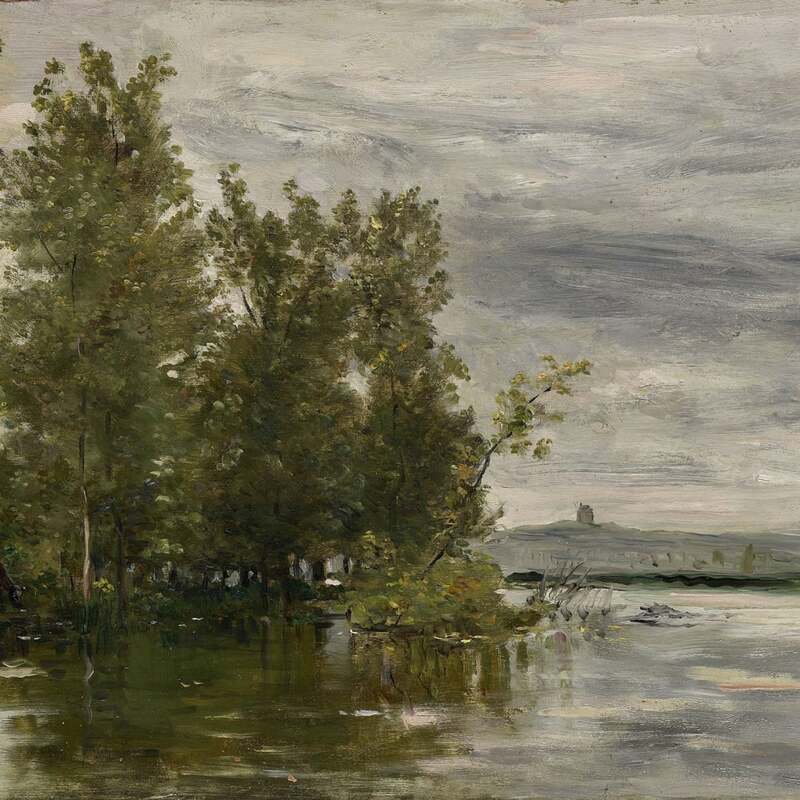 Charles François Daubigny | Stoppenbach & Delestre Ltd.
Charles-François Daubigny was a pioneer of plein-air painting who provided a link between the painters of the Barbizon School and the Impressionists. This was celebrated in 2016 with an exhibition at the Van Gogh Museum entitled “Daubigny, Monet, Van Gogh: Impressions of Landscape”. He was a great champion of impressionist artists at a time when they had little official recognition. Born into a family of painters and taught by his father Edmond François Daubigny and by his uncle, a miniaturist, Pierre Daubigny, Daubigny began painting en Plein airfrom around 1843 when he moved to Barbizon, in the footsteps of Corot. In 1866 Daubigny visited England, and returned there because of the Franco-Prussian war in 1870. He had met Claude Monet in London and together they left for the Netherlands. Daubigny was to provide both inspiration and support to Monet and his fellow Impressionists during their long years of struggle, a lone voice in their favour on the Salon juries of the 1860s. He later met Paul Cézanne in Auvers-sur-Oise, where he executed a number of his works. Characterised by a unique use of light effects and fluid brushstrokes, Daubigny, through his practice, conveys a feeling of spontaneity and truthfulness. His work focuses on an emotional response to the landscape, breaking away from the traditional ‘salon’ paintings that depict historical scenes and portraits. Much time was spent on his studio boat, which was another of the artist’s significant innovation to capture the transitional character of nature and paved the way for new experiments in landscape painting. His endeavours with colours and light will herald him as one of the most significant landscape painters of the 19th century and entice impressionist artists to reflect on new subject matters and techniques. Charles Baudelaire wrote that Daubigny’s landscapes “instantly convey to the viewer’s soul the original emotion with which they are imbued”. His works can be seen in numerous museums worldwide including the Louvre, Paris; The National Gallery, London; the Van Gogh Museum, Amsterdam; The Metropolitan Museum of Art, New York; the Museum of Fine Arts, Houston.